Elections seem to provoke the inner critic of many individuals. Even the layman was seen discussing politics as if he has aced the game of analyzing the political scene during the election season. 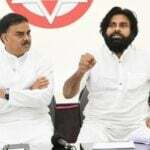 Sri Reddy is no different who several times had put forward her political opinions on TDP, YSRCP and Janasena. According to her, TDP did its best despite non-cooperation from the centre. One must remember that how CBN was instrumental in developing Hyderabad in Telangana. But, due to BJP’s political tactics against TDP, the people of AP were inclined towards Jagan Mohan Reddy, especially, the farmers. This is the opinion of Sri Reddy who thinks that Chandrababu Naidu did his part as a CM but the non-cooperative Union government put hurdles not helping AP’s cause. So, she thinks that TDP is going to win 40% of seats due to anti-incumbency factor mainly because of BJP playing the spoilsport. YSRCP will be winning 60% of seats as the people of AP wants to see if a new government can do something better than the present government. Whoever wins, she hoped that they would keep AP’s map among the developing States. Good.